Dividing cells spend most of their time (around 90%) in interphase. However, they are not just resting, but preparing for the next division. The first part of interphase, the G1 phase (Gap 1), is the period during which cells are growing, synthesizing proteins and making more organelles. Cells need to double their organelles and size before dividing, otherwise they will get smaller after each division! Cells then duplicate their DNA in S phase (Synthesis). This takes around 10-12 hours in human cells. Finally, it goes into a further growth phase, the G2 phase, before entering mitosis. During interphase, the centrosome (or microtubule organizing center, MTOC) is also duplicated. Here is an image of a cell in interphase. 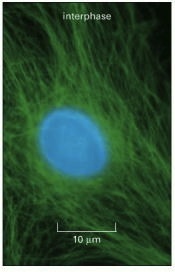 You can see its nucleus clearly, which contains chromatin (DNA in thread-like form, in blue). A cell in interphase. DNA (blue) is contained within the nuclues, and microtubules (green) are not organized. From Molecular Biology of the Cell, 4th ed, by Alberts et al. Continue reading about mitosis to see the structural changes that occur in the cell as it divides.